Learn about teams using microservices architecture from Martin Fowler--and how you shouldn't start any new project with microservices, despite what you think. Almost all the cases where I've heard of a system that was built as a microservice system from scratch, it has ended up in serious trouble. The first reason for this is classic Yagni. When you begin a new application, how sure are you that it will be useful to your users? It may be hard to scale a poorly designed but successful software system, but that's still a better place to be than its inverse. As we're now recognizing, often the best way to find out if a software idea is useful is to build a simplistic version of it and see how well it works out. During this first phase you need to prioritize speed (and thus cycle time for feedback), so the premium of microservices is a drag you should do without. The second issue with starting with microservices is that they only work well if you come up with good, stable boundaries between the services - which is essentially the task of drawing up the right set of BoundedContexts. Any refactoring of functionality between services is much harder than it is in a monolith. But even experienced architects working in familiar domains have great difficulty getting boundaries right at the beginning. By building a monolith first, you can figure out what the right boundaries are, before a microservices design brushes a layer of treacle over them. It also gives you time to develop the MicroservicePrerequisites you need for finer-grained services. While the bulk of my contacts lean toward the monolith-first approach, it is by no means unanimous. The counter argument says that starting with microservices allows you to get used to the rhythm of developing in a microservice environment. It takes a lot, perhaps too much, discipline to build a monolith in a sufficiently modular way that it can be broken down into microservices easily. By starting with microservices you get everyone used to developing in separate small teams from the beginning, and having teams separated by service boundaries makes it much easier to scale up the development effort when you need to. This is especially viable for system replacements where you have a better chance of coming up with stable-enough boundaries early. Although the evidence is sparse, I feel that you shouldn't start with microservices unless you have reasonable experience of building a microservices system in the team. I don't feel I have enough anecdotes yet to get a firm handle on how to decide whether to use a monolith-first strategy. These are early days in microservices, and there are relatively few anecdotes to learn from. So anybody's advice on these topics must be seen as tentative, however confidently they argue. Sam Newman describes a case study of a team considering using microservices on a greenfield project. 1: You cannot assume that you can take an arbitrary system and break it into microservices. Most systems acquire too many dependencies between their modules, and thus can't be sensibly broken apart. I've heard of plenty of cases where an attempt to decompose a monolith has quickly ended up in a mess. 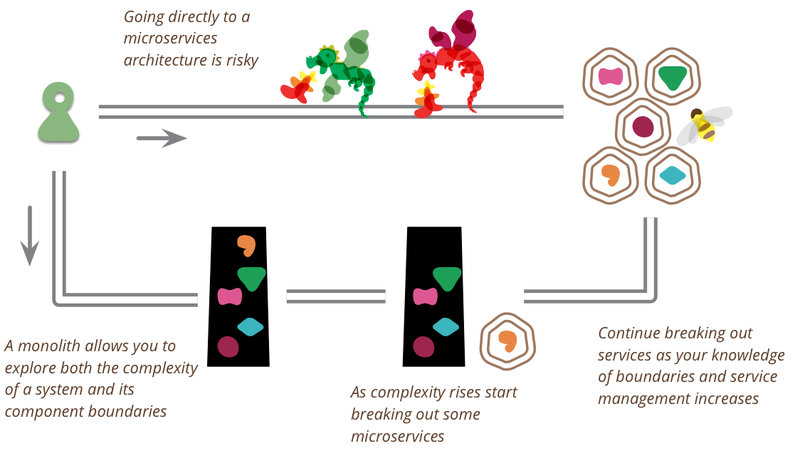 I've also heard of a few cases where a gradual route to microservices has been successful - but these cases required a relatively good modular design to start with. 2: I suppose that strictly you should call this a "duolith", but I think the approach follows the essence of monolith-first strategy: start with coarse-granularity to gain knowledge and split later. I stole much of this thinking from my coleagues: James Lewis, Sam Newman, Thiyagu Palanisamy, and Evan Bottcher. Stefan Tilkov's comments on an earlier draft played a pivotal role in clarifying my thoughts. Chad Currie created the lovely glyphy dragons. Steven Lowe, Patrick Kua, Jean Robert D'amore, Chelsea Komlo, Ashok Subramanian, Dan Siwiec, Prasanna Pendse, Kief Morris, Chris Ford, and Florian Sellmayr discussed drafts on our internal mailing list.